Get Onboard! graduates before talking with Community Foundation grant team about a grant like this helps them achieve their personal and professional. BACK TO SCHOOL: Horizon Goodwill has received a $1,120.00 grant from The Community Foundation of Washington County. This is so exciting – and what great timing: Back to School! As you know, we launched our Get Onboard! 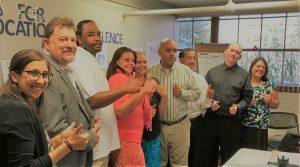 job readiness program in February of 2017, and since then have enrolled nearly 250 job seekers across Western Maryland and graduated over 75 Washington County residents with some participants finding employment during or right after completion. During this time, both Allegany College of Maryland and Hagerstown Community College (HCC) have provided instruction during Get Onboard! to help participants identify when continuing education or GED classes could be beneficial. The grant from Community Foundation will allow us to provide GED tutoring and classes for individuals with developmental disabilities and barriers to employment. Our Goodwill Workforce Development Team will use the money to really kick start our expanding continuing education initiative, with our first cohort drawing from students currently enrolled in Get Onboard! Goodwill will provide comprehensive tutoring for 10 Get Onboard! participants seeking to get their GED. In partnership with the Western Maryland Consortium and the Beacon House, the cohort will prepare to take and pass their GED exams. The grant amount was matched at 50% by the Community Foundation for operating expenses which will be dedicated to providing backpacks, folders, and study materials needed. For many, it can be scary making the commitment to “go back to school”. But now, job seekers can work on their resume and work to get their GED in the same place. 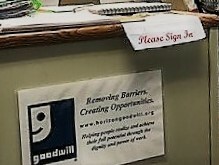 Education partners, like Beacon House and HCC, have instructors teaching at Goodwill’s Job Readiness Center on Prospect Street downtown. Thank you to the Community Foundation of Washington County for helping us advance Goodwill’s mission of removing barriers and creating opportunities. And, a very, very special thank you to the William Justice Family Fund, the benefactor, for ensuring Washington County residents with disabilities and barriers to competitive work have access to continuing education and job training.